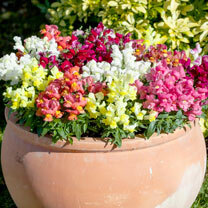 Colourful bedding plants are great for filling those beds and borders economically, and we love this compact variety. Crackle and Pop is a compact, bushy variety smothered in masses of flowers of red, yellow and pink shades, together with white. Flowers June-September. Height 15-25cm (6-10"). Ideal for beds and borders, patio pots and containers, greenhouses. Attractive to bees. Grows well in sun or shade.